Our annual day of helium excess is upon us. 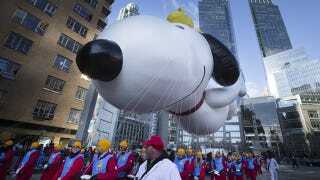 We speak, of course, of Thanksgiving and the Macy's Thanksgiving Day Parade. These giant floppy balloons, as tall as buildings and filled with 12,000 cubic feet of helium, are not graceful creatures. The average balloon requires 90 handlers just to get it down the street. Making these balloons is the full-time job of 28 employees at the Macy's Parade Studio. The blog of the American Chemistry Council has dug up some interesting details on how a giant balloon gets made, a multi-step process that involves clay models, water displacement, and computer scans. Handlers attend balloon boot camps in September and October to learn the ropes. "I recommend doing pullups, pushups, bicep and tricep workouts to get ready, because you really put your body into holding that balloon down," says [a former handler]. "It's hard work, but it also doesn't feel like hard work, because you're so giddy." The trick to nabbing the gig is nepotism: You have to know someone who works for Macy's. So just in case you wanted to do manual labor for free in the November cold, you know where to start looking.